England v Germany: 25/1 A Yellow Card To Be Shown at Ladbrokes! Ladbrokes are continuing to offer all our readers fantastic offers on the most anticipated football matches! 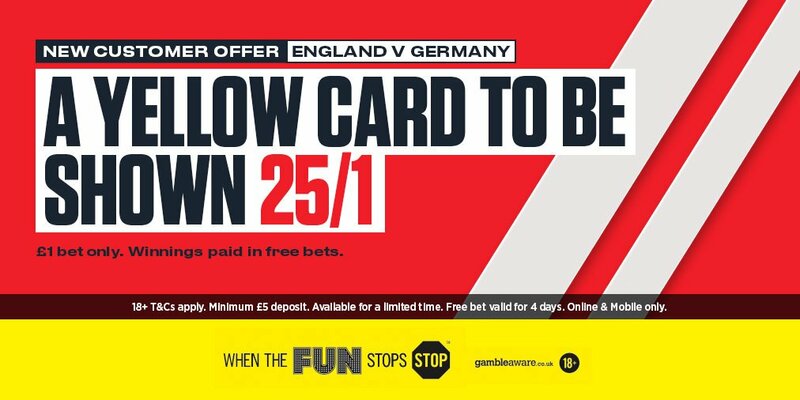 Claim a HUGE 25/1 any yellow card to be shown during England vs Germany on Friday night. This is definetely your best chance to make a profit on this international friendly! This is a massive chance to make easy money on England v Germany! Altough it is an international friendly, there are plenty of reasons to believe that a player will be booked, given the old rivalry between these two nations! Get paid at 25/1 as soon as a yellow card is shown during the match! Join Ladbrokes via our special links and claim 25/1 for a yellow card to be shown during the match! 1) Register a new account with Ladbrokes via this special link. Use promo code YELLOW1. 3) Place a single bet of up to €/£1 on ANY yellow card to be shown during England v Germany before the kick off. Offer available to new Ladbrokes Online & Mobile customers: Simply register today using promo code YELLOW1, deposit a minimum of £/€5, and place your first bet as a single bet of £/€1 A yellow card to be shown in England v Germany 25/1. This offer is available from 08:00 Tuesday 07/11/17 until kick off (20:00) on Friday 10/11/17.